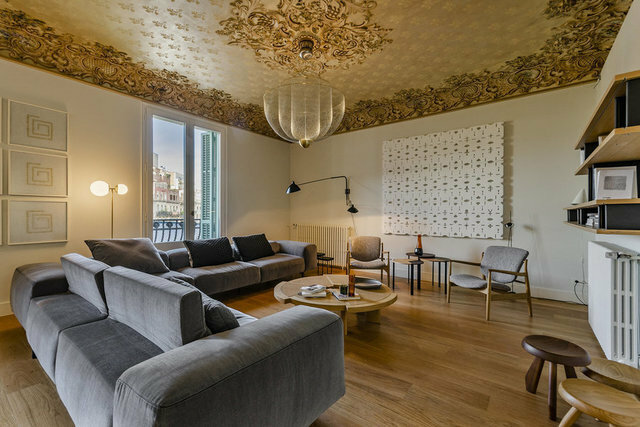 Having a Casa Burés apartment is living in the very history of Catalan modernism but with all the comforts and luxury of contemporary life in the big city. It is 145m2 built, where the qualities and details are the real protagonists. The hydraulic mosaics are authentic works of art that decorate the different floors of the property in the form of mats combined with natural wood flooring. In the same way, traditional modernist stuccoes with floral motifs and vegetation cover most of the roofs. The floor design is presented in a day area composed of living room and kitchen in a large open space to the wrought iron balconies of the chamfer. For its part, the private area consists of two double rooms with access to the terrace and two bathrooms. The community facilities of the property include swimming pool with solarium on the roof, indoor pool, gym, living room, among other spaces for their owners and guests.